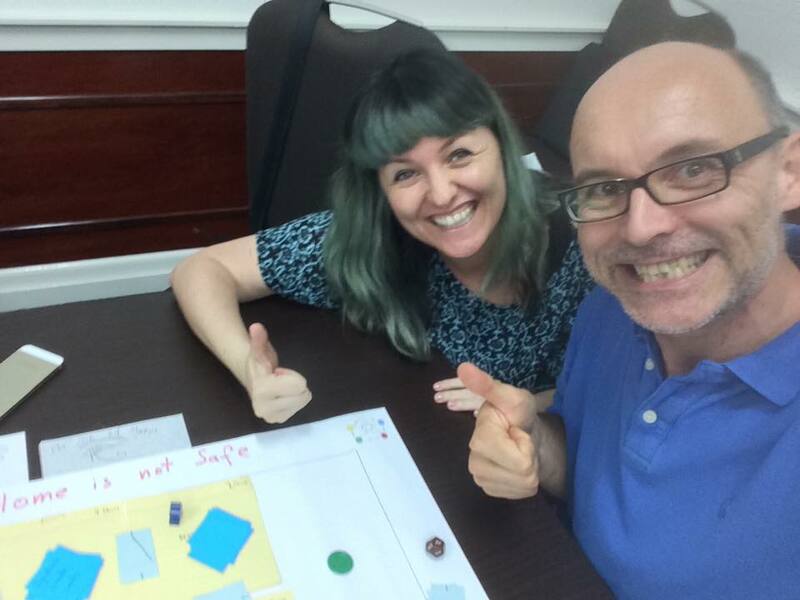 One of our professional teams decided the home was earth and the solution to it being unsafe was to take to space exploration. Little ships move out from the centre, drawing from a deck of cards to explore the galaxy, most depicting planets with die-roll/result tables on them, and tracking quantities of fuel, ore and food on player-cards in front of them. Familiar mechanics of tile flipping, rolling to produce and resource balancing with added spice of the win condition depending on establishing colonies, but the more you establish the more food you must provide. Judges and players found it easy to jump into and engaging, and it only lost points for a floppy end game that might never come and for not being enough about homes being safe. The Tyrant team were keen to fix these issues and develop this with lots of ideas to come – hexmaps rather than cards, a larger tile deck and random events. The intruders are coming into your house. You’re safe in the panic room but the goal is to stop the intruders with your Home-Alone kind of traps. Players randomly assemble the house on a 9×9 grid around the Panic Room, then work together to place trap components in what they hope will be the ideal places. Traps need a Trigger, a Trap Type and a Modifier and the wrong trigger will prove defeatable by some intruders, and the wrong modifier will depower or even nullify some traps. Spikes work in a pit, but not with a net trap, for example. This virgin game design duo perhaps took too long thinking and picked an idea too big to accomplish in the time left so were nervous at the end but the judges enjoyed the directness of the theme and loved the basic mechanics, even if some of the math didn’t (yet) work. Tagged for great potential and new ideas. The Die of Horus are super happy with Home Is Not Safe! Like Home is Not Safe the kids were the focus here, racing along the upstairs hallway to be first back to bed, despite the floor being covered in lava and such. This professional team focused on making the game small and the cutting out minimal – focusing mostly on a lined piece of paper and pack of regular playing cards, which meant they were able to get three full playtest games in before judging. The theme was there to be added though, and the judges could see the potential for great art to come, and meanwhile the race-lane mechanics seemed different and fairly solid apart from edge cases like an early leader or everyone bogged down going nowhere. Probably the most complete game of the set and people could visualize everything it could be with art added. Like After-Earth the distance from theme may have cost these guys but it was wonderfully different: here the home was a colony of meerkats. Using a deck building mechanic to collect tunnel cards from a central deck and a worker placement mechanic to move meerkats through those tunnels, players competed to have the most thriving population of desert mongeese. Poor planning will see you run out of food but not all family members can gather because guard meerkats help protect against hawks and jackals. Full of educational value and lovely theme, judges saw potential here but not enough robustness – as it was it was still luck-based and low on meaningful choices. But it could be a strong seller in the educational market if those things were fixed and it moved further along its burrow. Bellpepper included some seasoned game designers (look for Jason’s Ragnaroll on kickstarter soon) and they had perhaps the most playable game after Spooky Sleepover, again cleverly narrowing their focus down to a short beer-and-pretzels card game that had player knock-out but it didn’t matter because it only lasted fifteen minutes. The tongue-in-cheek theme was adored by judges and players alike: players are rival megacorps assuring the world (through owning the media) that your home is not safe, then releasing terrorists to drive up panic and thus sales – more panic justifies more brutality, but too much panic will lose sales just as much as too much brutality. This tied with Spooky Sleepover in third place and probably was the fan favourite of the day because while still too random to have solid choices the theme was unstoppable. Again, small focus helped this game be the little engine that could. As one judge put it “it was obviously a Werewolf derivative but it was a Werewolf derivative that brought two brand new ideas to the table”. The designers took the home to be a villa in occupied France and the safety threatened by a mole. WIth only five minutes the loyal resistance (who all know the code word) must figure out who doesn’t know the code word by talking about it in hints…without giving it away. If the time runs out without a consensus, the mole wins, so you must hint fast and decide faster. Finishing mechanics early gave these guys time to develop their theme hard, writing spiels for the first player to read aloud and evoke the strong theme with visuals like the bullet of accusing and opportunities for roleplaying. Something about French accents and French wine and the clever word-hiding mechanic in this caught all three judges’ minds and in the consulting period they kept talking about what could be done with this. Which is probably why it was the winner! Second place went to Home Intrusion, a big surprise for Sam and Jackson too. But winners aside, everyone I talked to was happy and even surprised by what they had created, and almost everyone had plans to take their games further, even to publication. People who had never designed a game in their eyes had words like “kickstarter” and “art submission” on their lips. Of course, after two hours of pumping energy, that’s to be expected. The danger now is not to LOSE the energy. I saw some games in 2010 go on shelves and be forgotten – it happens after every contest like this. The chefs faced an incredible challenge in two short hours, but now the challenge begins anew: to keep the energy and carry it forward, and get these games to blind testers, to publishers and to stores! This entry was posted in Uncategorized by dconstructions. Bookmark the permalink. Pingback: Selling a Horse at an Automobile Conference: Talking Australian Board Game Design at Freeplay 2015 | Action Points!